Stay dry â Inside and out The advanced On membrane is 100% water- and windproof and physical, not chemically coated, meaning it does not wash out over time. This allows it to be highly stretchable, lighter overall and far more breathable compared to most other waterproof shoes on the market. Micro-engineered Grip-Rubber sole The Grip-Rubber profile of the Cloudventure performs in the most demanding conditions. Its sole is micro-engineered with four distinct levels of grip, so youâre always in control. Intelligent CloudTec cushioning The patented CloudTec sole has 11 individual pods that stretch back upon impact to offset the forces of downhill running. We call it horizontal cushioning, and it comes on top of our standard vertical cushioning. 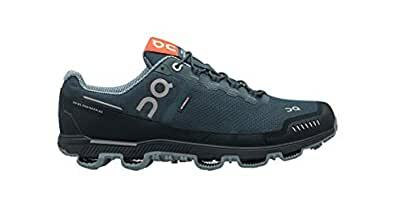 Made for the trail Every aspect of the Cloudventure has been engineered with the ultimate trail running shoes in mind â right down to the toe-caps. Fused with rubber and engineered mesh, it provides protection for the toes while still remaining lightweight and flexible.